It was rolled out and filled with a pint of fresh blueberries. They were mixed with just the right amounts of sugar, cornstarch, and cinnamon. 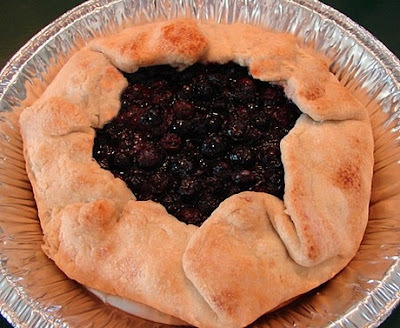 The dough was folded up and around, covering some berries, while leaving others exposed to be dotted with small pieces of butter. A light sprinkling of sugar rained down, and in the oven it went. After being baked golden, in a 33 cent pie tin, it was served with vanilla ice cream and my family. It was almost transferred to a pretty plate to be photographed, but that just didn’t seem right. Enjoy! Yes, of course I will demo this crude, yet beautiful pastry. you better!! I think thats called a galette? Looks good. Oh I made the key lime pie, I put it on my blog. I used real key limes. I want the recipe for the blueberry desert. Thanks, yes, hopefully there are some nice berries at the farmers market this weekend and I'll film that one soon. Stay tuned! Seven Eleven Sixty Three - Happy Birthday to Me! Am I Blogging to Fame? What did people watch before FoodTV?